6 plus 6: IT Ecosystem - Cloud Coming Out - Feet on the Ground, Head above the Clouds! IT Ecosystem - Cloud Coming Out - Feet on the Ground, Head above the Clouds! Since more than 5 years now, I follow the IT Ecosystem's migration towards Outsourcing, Managed Services, SaaS and Cloud. I support the Cloud "Coming Out" of IBM Partners. I can see how each category of IT players progressively move from "Cloud Canada Dry" or "Cloud Washing" to real Cloud offerings. Traditional IT providers are pragmatic and keep their feet on the ground when facing the Cloud Tsunami! Generally, they start their journey to the Cloud with "Cloud Canada Dry" or "Cloud Washing". 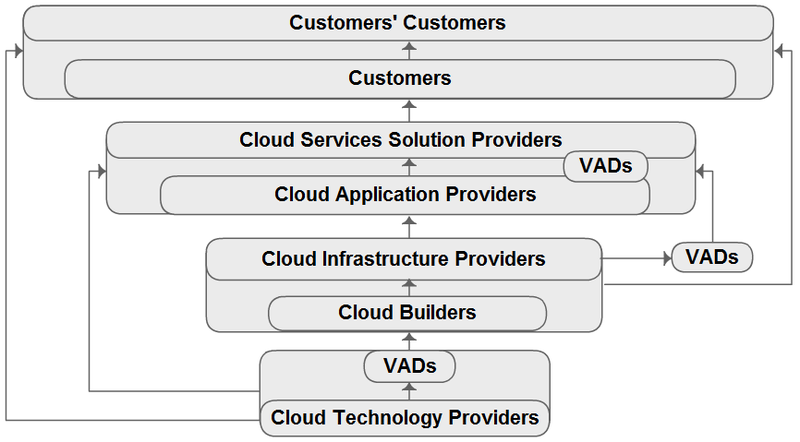 add some functions to make them more virtual, standardized, automated, "Cloud ready"
VADs [Value Added Distributors] and Distributors typically follow their vendors. Most advanced of them also announce the future availability of their Cloud Services Aggregation Platform. continue to install infrastructures on their customers premises or in traditional datacenters, using typical "project" and "Capex" models. Their CIO customers follow their path or request Private Cloud solutions. but typically continue to task "software blue collars" and other human operators to run and manage them [provisioning, administration, monitoring, billing...]. host them in datacenters [their own datacenter or, more often, those provided by specialized hosters], on dedicated or virtualized servers, with dedicated or mutualized access. rename them by adding "SaaS", "on demand" or, since a few years, "Cloud". invoice them periodically [eg monthly, quarterly, annually], with or without customer commitment, using some usage metrics [eg per user, per transaction, per unit...]. better XaaS offerings [especially SaaS] and some help by their traditional partners [ISVs, vendors, distributors and other providers] in order to migrate their business model. more pressing/precise requests from their customers [Beware: despite the lack of interest and of skills demonstrated by their usual "Trusted Advisors", these customers are nevertheless more and more conscious of the business benefits of Cloud solutions!]. All IT Ecosystem Partners are forced to transform their business when they REALLY embrace the Cloud. They then reinvent their business and rethink the way they deliver IT to their customers. By following the steps of existing Cloud Pure Players, they understand the neeed to specialize and to surround themselves with complementary partners. Cloud Application Providers who procure these services either directly from the Cloud Infrastructure Provider or through a VAD [who then plays the role of a Cloud services aggregator] and leverage them to build and deliver their SaaS and/or BPaaS solutions. 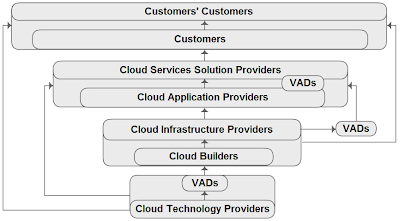 or through VADs, Cloud Services Solution Providers [or also other Application Providers] who resell and/or integrate these services in their own solutions. ... are not always "End" Customers and can themselves become Cloud Providers [IaaS, PaaS, SaaS and mostly BPaaS] for their own Ecosystem, their own entities/units, their own Customers! What about you? 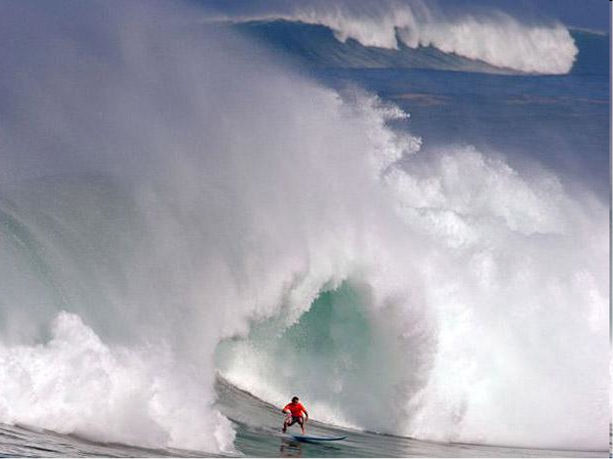 Are you ready to focus and to Partner to surf the Cloud Tsunami?